SAN DIEGO, CA--(Marketwired - August 08, 2017) - In following the current trends in corporate urban migration, two leading global firms have signed leases with EMMES Realty Services of California LLC and will be relocating to 1 Columbia Place in downtown San Diego. 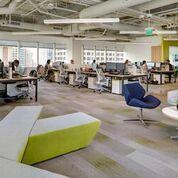 Global digital marketing agency iProspect, which has more than 4,200 employees in 91 offices across 55 countries, now occupies an entire floor of 1 Columbia Place. 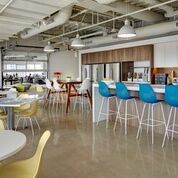 The company, which has relocated its 80 local employees from UTC to downtown, works with leading brands such as General Motors, Adidas, T-Mobile, Hilton, Sunglass Hut, and Microsoft. "We're so excited to now be in the center of San Diego, and our employees look forward to using all the amenities that 1 Columbia Place and downtown offer," said Jon Leicht, SVP Managing Director, West, iProspect. 1 Columbia Place includes superior technology infrastructure such as enhanced Wi-Fi coupled with a building-wide Fiber Optic Network, as well as amenities such as expansive terraces with hotel-style lounge seating, in-building retail shops and restaurants, banking, multiple conference centers, an indoor cycling studio, secure tenant bike storage, as well as shower and locker facilities. The 27-story, Class A building is an iconic landmark noted for its distinctive glass façade, stair-step design and high-flying American flag, one of the largest in downtown San Diego, residing on its rooftop. The building also features a dramatic seven-story atrium lobby, common and private exterior terraces, and spectacular views of San Diego Bay, Coronado Island, Balboa Park and all of downtown San Diego. 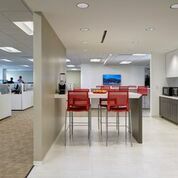 The amenities offered at 1 Columbia Place and downtown played a part in the decision by global engineering consulting firm Syska Hennessy Group to move from its Kearny Mesa office. Sean Marcel, associate partner of Syska's San Diego office, said downtown also puts the company closer to clients, colleagues, restaurants, and employee residences. In fact, he said, some of the company's 27 employees plan to bike to work. "Moving downtown puts us close to a large portion of our clients," Marcel said. "After settling on the downtown area, we looked at about 25 places -- the Columbia District, Little Italy, Gaslamp, and East Village. Our team is psyched about our new space with the views and amenities to support a collaborative environment." "Our New York office is right in Times Square, so I'm used to just walking downstairs to meet with clients throughout Midtown," he added. "As a professional service firm, being able to easily meet a client for lunch or coffee really helps us to support their projects and build relationships." Syska provides MEP, technology, commissioning and architectural lighting design to the aviation, biotechnology, convention centers, corporate offices, healthcare, higher education and hospitality sectors. The firm's local work has been included in the Manchester Grand Hyatt San Diego and the iconic County Administration Center, in Terminals 1 and 2 at the San Diego International Airport, and on the campuses of University of California, San Diego and San Diego State University. "We are pleased to welcome Syska Hennessy and iProspect as new tenants within the downtown San Diego EMMES portfolio," said Mark Kuske, Asset Manager of EMMES Reality Services of California LLC. "As downtown San Diego grows its reputation as a catalyst for innovation, creativity, and entrepreneurialism, we are seeing more and more companies choosing to be downtown instead of the suburbs. We think this trend will continue and hope to attract more businesses downtown by activating the street fronts along Columbia Street, as well as revamping our downtown properties to revitalize San Diego's urban landscape, and transform downtown into a true cutting-edge urban center."